Sing sorrow, sorrow, but let the good prevail.” So goes the chanted refrain of a three-man chorus of city elders as they speak of the great Agamemnon to the young boy in their company, too young to have met the Mycenaean king before his departure for the Trojan War, too naive to truly understand the origins of his family’s perpetual bloodshed. Agamemnon, the second in Court Theatre’s three-tragedy cycle, builds upon the story begun in last fall’s production of Iphigenia in Aulis: the tale of the House of Atreus, a powerful Greek family with a legacy of familial slaughter. In Iphigenia, the eponymous first-born daughter of Agamemnon dies at his hands, sacrificed to the gods so that the Greek fleet might find favorable weather conditions as they sail to war from Boeotia to Troy. Ten years elapse as the lights dim for Agamemnon, and the Greek fleet is making its victorious, long-awaited return home from battle. But the return, which one would expect to herald joy, does no such thing. Although the two tragedies were written by different hands—Iphigenia by Euripides, Agamemnon by Aeschylus as the first third of the tragic trilogy the Oresteia—the latter does not forget the lasting despair of Clytemnestra, the deceived mother of Iphigenia. The early incantations of the chorus set the trepid tone that endures throughout the play, a tone that is augmented by the audience’s knowledge of the imminent murders of Agamemnon and Cassandra, the prophetess of Apollo he brings home from Troy as a concubine. But a superb quartet of cast, directing, set, and costumes holds the audience captive in their seats to a play that, for its innumerable translations and productions over the years, remains as enthralling and relevant as ever. The audience first sees Clytemnestra (Sandra Marquez) when an imposing pair of black doors at center stage swing open forcefully, as if by the will of a deity. Clytemnestra stands in the small foyer, laughing maniacally as she scrawls on walls that were once a pure white: Iphigenia. IPHIGENIA. IPHIGENIA. Marquez brings to Clytemnestra’s character a womanhood that is fierce and sensual, but all the while calculating. She acknowledges unapologetically her capability as ruler of the House of Atreus and, by virtue, the city of Argos in the absence of her husband: “I am a queen, and there is no shame to speak of it.” Even the chorus, loyal to her by virtue of her marriage to Agamemnon, but wary of her cunning, concedes that she possesses the “wisdom of a sensible man.” Yet the extent of her power needs no verbal affirmation; as she dances her fingers over her body and through the air around her, imitating the movement of the beacons that alerted her to the Greeks’ victory over the Trojans, she reduces the men of the chorus to quivers and moans on the floor. Not even upon the return of war-weary, icy-eyed Agamemnon, played this year as last by Mark L. Montgomery, does Clytemnestra allow her rage at her husband’s deceit to eclipse her cunning, though the bitterness in her voice betrays her in a way that the content of her lengthy speeches does not. They partake in a mistrustful dance across the stage and weave around the chorus as Clytemnestra caresses her husband’s ego in an (ultimately successful) maneuver to reaffirm his trust in her before bringing his first day back in Argos to an unexpected end. But it is the continuous onstage presence and dialogue of the fantastic chorus (played by Gary Wingert, Thomas J. Cox, and Alfred H. Wilson) that sustains the play between the lengthy monologues of the more explosive central characters. While sole occupants of the stage, the chorus members present their own multifaceted take on ongoing events, as well as their hopes for their city, with the added emphasis of the stamping of canes and gestures towards the heavens, and with teary eyes as they clutch at the white kerchief of Iphigenia. And when Agamemnon cavalierly presents Cassandra, his new addition to the house, Cassandra sits stunned, responding to neither Agamemnon nor his seething wife. Only when the conciliatory chorus cautiously and kindheartedly approaches her does she begin her haunting song, part prophecy of the murder that is shortly to occur, part lament of the curse of Apollo—because she rejected Apollo’s advances, not a word Cassandra speaks reaches believing ears. 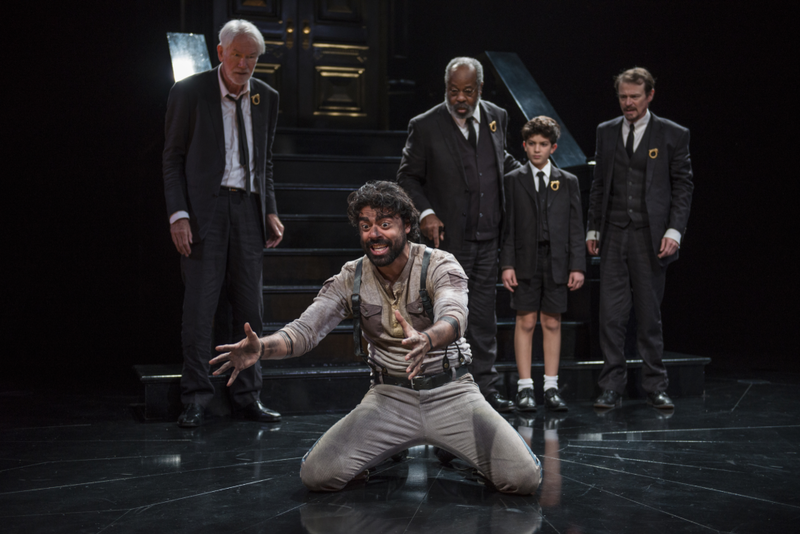 Agamemnon’s translator Nicholas Rudall, University of Chicago Professor Emeritus in Classics and Court Theatre’s Founding Artistic Director, is known for the “playability” of his translations of ancient literature, and Agamemnon is no exception. Rudall forgoes the formality characteristic of many translations meant to be read alone in favor of a script that resonates with a modern audience. Rather than having his chorus speak at length in unison, or chant and dance as they would have in an ancient Greek production, Rudall has them partake in dialogue with each other, with the exception of short refrains (“Sing sorrow, sorrow, but let the good prevail”) and invocations of the gods, which they chant together. The fusion of dramatic elements characteristic of Greek tragedy and a more casual dialogue format make for a more dynamic play and more relatable characters, as well as for a variation in opinion expressed by the chorus—about, for example, the nature of Clytemnestra’s rule and the validity of justifications employed after the killing of a family member. One of the results of this “playable” translation is that even at the play’s most tense moments, an offhand remark by a character elicits laughter from the audience, a reaction one doesn’t necessarily expect during a tragedy. After a monologue in which Clytemnestra persuades her husband to walk into the household on the finest of purple fabrics, as is only fit for a king, she urges, Agamemnon turns around to say, “You made a speech much like my absence—long.” The audience laughed, sympathetic to the character who can’t get a word in over a loquacious companion. The modern costumes and set, designed by Jacqueline Firkins and Scott Davis respectively, also prevent the alienation of the audience from the literature of a world 2,500 years distant. There are no togas to be seen here, but rather, for the chorus, a uniform of navy linen suits—one with shorts for the young boy—and gold brooches, and for the herald dispatched by the Greeks to announce the fleet’s imminent return, a pair of side-striped pants, suspenders, and leather boots. Aegisthus, Clytemnestra’s lover, introduced only after Agamemnon’s murder, looks like he walked straight to the theater from a dinner in his dress shirt and pants combo. The complexity of pulling Agamemnon into another, newly formulated trilogy comes through in the play’s last scene. Agamemnon’s slaughter is fantastically gruesome; a bloodied Clytemnestra drags the tub in which Agamemnon and Cassandra lie dead to the top of the stairs, in full view of the audience, But when Aegisthus, who is also Agamemnon’s cousin, emerges from the house to justify and take credit for the murder of Agamemnon, what should be a climactic point loses some of its force. Aegisthus’s tracing of the violence within the House of Atreus, which a flow chart in the play program helpfully illustrates, is important contextual information. But it is less crucial here than it would be as the first play of the Oresteia, and Aegisthus’s matter-of-fact delivery of lines bearing so much information puts a damper on a scene that should have none, pushing the play towards an ending less powerful than it had the potential to be. There may also be a slight sense of regret at the sight of Clytemnestra standing at Aegisthus’s side; no longer the woman in control of the House of Atreus and Argos, Clytemnestra is now the woman of a man intent on restoring order to the house that, for now, belongs to him. But if the ending leaves something to be desired, it by no means obscures the brilliance of the performance in its entirety. If anything, Agamemnon leaves one wishing that Court would present a tragic trilogy in the true ancient Greek way—over the course of three or four days rather than years.